Kill every monster on the level, grab the loot and move to the portal! But what's that? Monsters are following you! And they're becoming stronger and smarter! And the dungeon itself becomes darker, crippier and more dangerous! How long will Sir Bucket survive? Each enemy in DungeonRift has its own perks, abilities, stats and evolution paths. Every run won't be the same - different monsters choosing their own professions, defining their behaviour and tactics - and Sir Bucket wil have to choose new strategy every time. 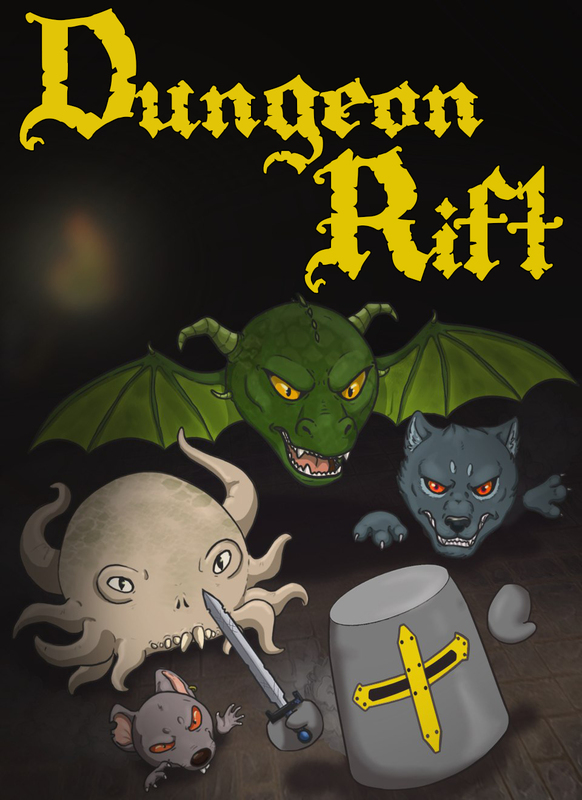 Various evolutions paths for monsters, dozens of dungeon layouts, menacing traps, weapons with different mechanics, dark humor, sweet and tasty hand-drawn art - it's all present in DungeonRift. And there is much more to come! We will appreciate your support! Developing was started for Games Jam 2014 hackaton, but then we decided to continue this project. The game is still on active development stage - we will launch some more feature and content updates before official full release. We will appreciate any feedback! DungeonRift recently received "100% clean download" badge on SoftPedia! 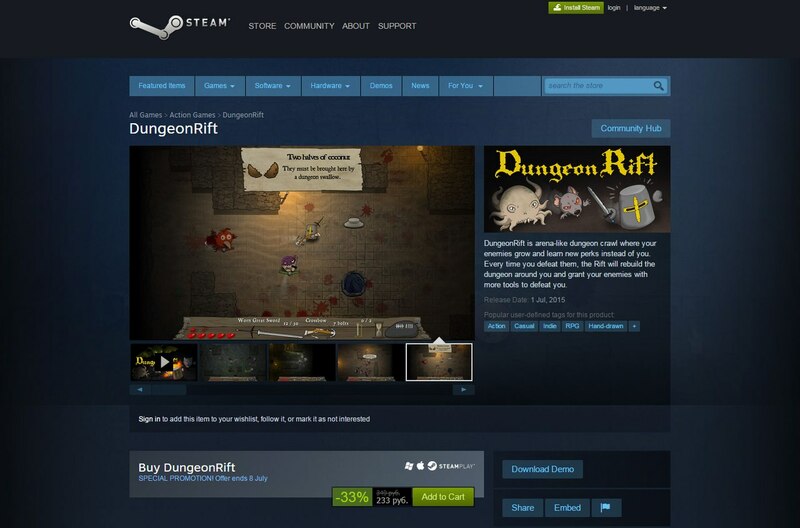 DungeonRift is live on Steam! We made it to Steam Early Access! We’ve started our Early Access with a bunch of new mechanics, to make our first commerce version as much feature-rich and and interesting as we can. First of all, we got new playable character - barbarian Ironbraids! He’s unlockable after a few runs and differs from Sir Bucket with lower speed, tougher armor, inability to conjure magiac and count. Also he got different active ability - Battle Dash in which he charges at his enemies, pushes them around and inflict sirious damage. Oh yes, we have active abilities now - for Bucket it’s Dodge-Roll, that makes him invulnerable for duration of rolling out of danger. Poland can into roll too! Enemies are ready for heroes and their ambitions - every couple of levels one of the monsters becomes King of the Rift, that make him tougher and gives him a fancy crown. “Fanciness” of the crown is determined by monster’s level. In future every monster will have a unique ability for his moment of royalness. New range weapon - Lightning. Unlockable. Welcome the last free-for-all version of DungeonRift! DungeonRift Alpha 7 is here! Our quality-based update has been released. There is few major features, but lots of polishing and balancing! Alpha6 version has been released! New DungeonRift update is here! We were working hard on it, check it out! We kinda planned to release an update or two, but... Oh well. We've got Greenlit in 7 days, and this is amazing! Archive with Windows32 version of official demo build. Suitable for Windows XP. Archive with Windows64 version of official demo build. Suitable for Windows 7+. Hm... It's interesting, we will try to reproduce that. Thank you! Are we allowed to make Let's Plays ? Wrong colors of Polandball is a meme inside a meme. There is a lot of comics joking about it and almost everywhere Polandball appears with this colors. We're trying stay true to the source-material.